A Hydrogen Car - Is it possible to run a car on hydrogen? A hydrogen car uses hydrogen as its on-board fuel for motive power. The power source of a hydrogen car comes from the conversion of the chemical energy in hydrogen to mechanical energy. This can be achieved using one of two methods: combustion, or electro chemical conversion via a fuel-cell. With hydrogen internal combustion engine vehicles, the hydrogen is combusted in fundamentally the same method as traditional internal combustion engine vehicles. In the case of fuel-cell conversion, the hydrogen is reacted with oxygen to produce water and electricity, the latter of which is used to power an electric traction motor. Buses, trains, motorcycles, wheelchairs, ships, aeroplanes, submarines, high-speed cars, and rockets can already run on hydrogen in various forms. Many companies are currently researching the feasibility of building commercially viable hydrogen powered cars. Most of the automobile manufacturers had begun developing hydrogen powered cars. However, the Ford Motor Company has dropped its plans to develop hydrogen vehicles, stating that "The next major step in Ford’s plan is to increase the volume of electrified vehicles". Nissan also announced in February 2009 that it is cancelling its R&D efforts. Most hydrogen vehicles are currently only available as demonstration models or as a lease construction in limited numbers and are not yet ready for general public use. 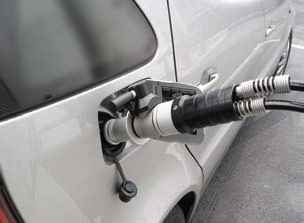 The recorded number of hydrogen powered public vehicles in the United States was 200 as of April 2007, mostly located in California - this number does not factor the many thousands of vehicles running "water powered car" conversion kits. Hobbyists and independent investigators worldwide are working on various electrolysis-like projects which put out more energy than was required to run the electrolysis unit. These pursuits go by various names such as "Brown's gas" and "water fuel cells"; and have various heroes, such as the late Stanley Meyer. The current land speed record for a hydrogen vehicle is 333.38 km/h (207.2 mph) set by a prototype Ford Fusion Hydrogen 999 Fuel Cell Race Car at Bonneville Salt Flats in Wendover, Utah on August 2007. Honda has also created a concept hydrogen powered car called the FC Sport, which may be able to beat that record if put into production. Funding for research into hydrogen as a fuel for automotive use has come from both private and government sources. Hydrogen is an obvious alternative to hydrocarbon fuels such as gasoline. It has many potential uses, is safe to manufacture, and is environmentally friendly. Today many technologies are able to use hydrogen to power cars, trucks, electrical plants and buildings — yet the absence of an infrastructure for producing, transporting, and storing large quantities of hydrogen prevents its practical use. Subsequently, the development of a hydrogen car suitable for mass production appears to be a fading reality. Most research and development companies are now favouring the development of an electric car over a hydrogen car.